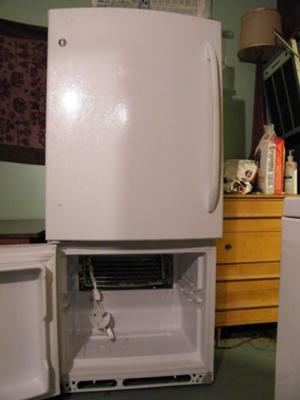 I bought my GE bottom freezer refrigerator (model #gbrc0gaxarww - which now called GBSC0HBXWW) in February 2008. It died 38 months later in May 2011. I bought the bottom freezer style for an elderly person because I thought it would be easier to use for them. Not so much. The freezer compartment developed a glacier because the automatic defrost failed. Fan became unbearably noisy. I quickly bought a used Amana, drove 300km and did a swap. I now have the GE unit and have removed the freezer back cover and the fridge top control panel. The circuit board in the top panel, if dead, will cost $250 to replace and by the looks of it, probably cost GE about $5 in Mexico. The defrost heater is also $250. Hopefully it is the temperature sensor or the defrost thermostat. Paying someone to fix it rivals the purchase price and it will likely die again. Despite being only 3 years old, GEappliances.com denies the existence of the model number so how can I get the repair manual. Cheap plastic drawer support integral to a modular shelf broke due to normal weight. The duct work inside is just cheap crumbly Styrofoam and the whole thing is cheap. I am a fool guilty of false economy. In summary, this GE bottom freezer refrigerator is cheaply built, quickly failed, GE denies the model number even exists, and I've lost not only money but time. I feel they are coasting on a once respected name. It died 3 months later during a power surge. Eventually got a scan of the correct circuit diagram from GE tech support. Verified defrost heater & temp sensor were OK and gambled on the rip-off circuit board and "won" since that was the problem. in 2018 it died again. Meanwhile the LG I bought in 2003 is still running beautifully. a) One helpful knowledgeable person at tech support among an ocean of terrible support and worthless online information. b) Cheaply designed fridge in every way and no dedicated temperature control in the freezer. I will try and repair the controller electronics myself an otherwise scrap the fridge. Lesson is never buy GE again. Join in and write your own page! It's easy to do. How? Simply click here to return to GE Refrigerator Reviews.